The space tool known as Zoidberg 2.0. The white boxes are designed to scoop up rocks off an asteroid. BSU’s Microgravity team was just one of several college groups to take the challenge to design and build a tool that could be used to collect rock and dust samples off of an asteroid. Zoidberg 2.0 has a handle with a grip one end and three small boxes on the other. The boxes can be opened and closed with the handle, to scoop up rock samples. Marina Autina is on the Microgravity team. She went to Houston and was poolside when Zoidberg 2.0 was tested by a team of divers at the neutral buoyancy lab, which is basically a big swimming pool that mimics zero gravity conditions. Microgravity team member Chris Ruby also made the trip to Houston. He says the trigger was a little stiff at first, but loosened up in the water. 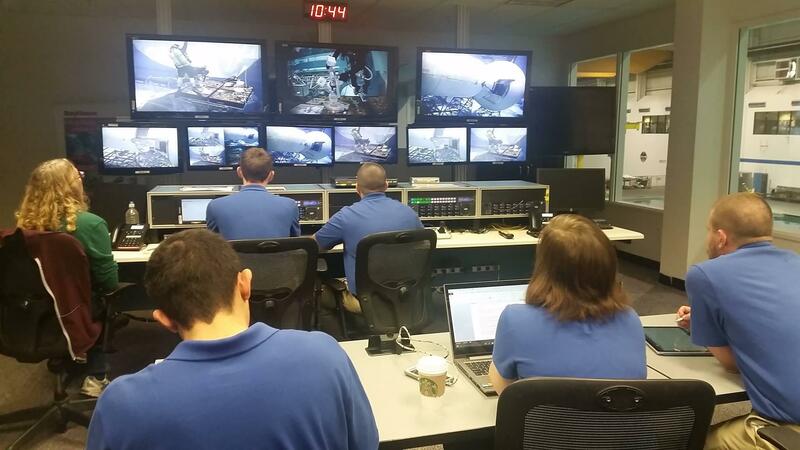 The BSU Microgravity team in Houston guiding a diver through a test of Zoidberg 2.0. The team still has some outreach projects planned and must send a final report to NASA. Someday, the space agency could use design details from Zoidberg 2.0 for a tool it takes on a mission to study asteroids. Ruby and Autina say it was definitely a team effort to get Zoidberg 2.0 built. “I’m very glad BSU has the resources it does for us. It wouldn’t have been possible without our mentors,” says Autina. Ruby and Autina says there will be another NASA Microgravity team next year. They don’t know if that team will improve Zoidberg 2.0 or try a different challenge. Meanwhile, some of this year’s Microgravity team plan to enter a different contest, co-sponsored by NASA, to build an autonomous robot. Ruby says he’s ready for the new challenge. “It has to autonomously collect rock samples on the ground, so as if it were an actual Mars Rover. It will have to go around and collect rocks and store them without cross-contamination,” says Ruby. “We’re thinking about naming it Bender,” jokes Autina. Bender is the robot character on Futurama.